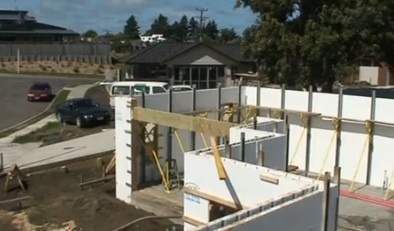 A prototype for a line of energy efficient homes that will be offered by eHaus, a new development company in Wanganui, New Zealand. 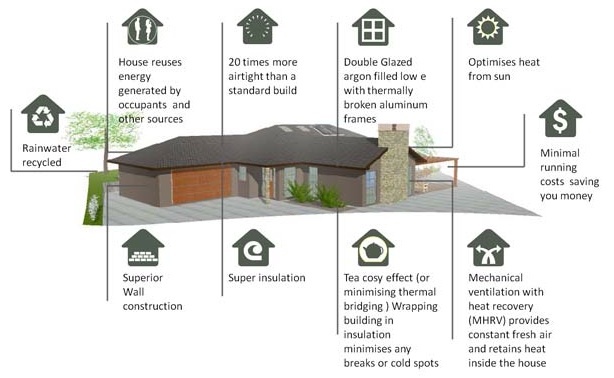 The partners in the company aim to offer homes that will perform to the Passivhaus criteria, although the prototype is expected to fall just short of that standard. 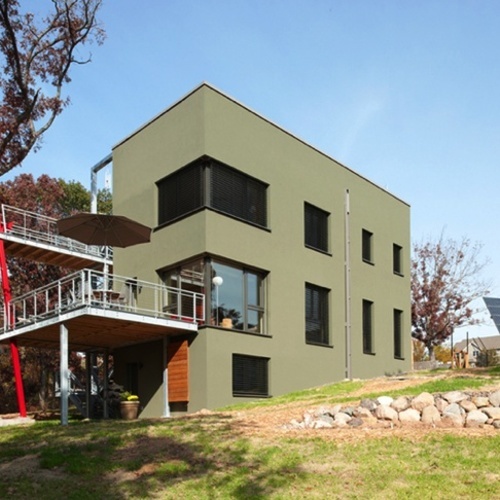 Image Credit: eHaus ECO-Block insulated concrete forms were used for the exterior walls of the eHaus prototype. The eHaus prototype will include a water recycling system designed to meet all of the occupants’ water needs except drinking and cooking. 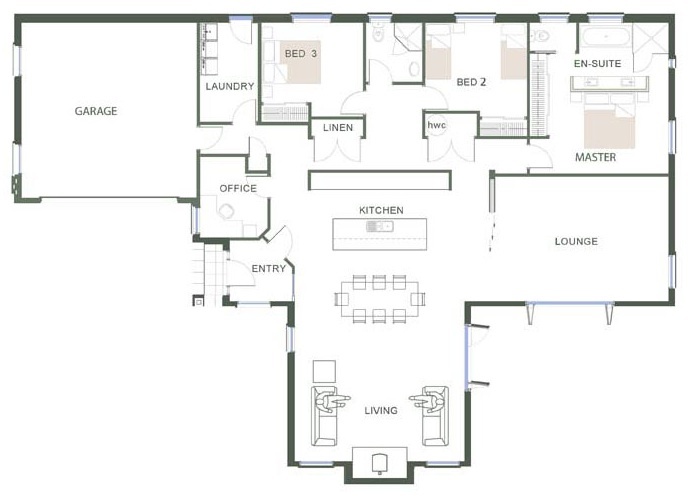 The eHaus includes four bedrooms, two baths, and 2,422 sq. ft. of interior space. For mechanical engineer Jon Iliffe and homebuilder Baden Brown, who both live on New Zealand’s North Island, the urge to create a line of high-performance homes began percolating about a decade ago. They kept talking as the years went by, until Iliffe returned from an 18-month stay in Europe, where he did contract work for Rolls-Royce and had an opportunity to study Passivhaus design and see homes built to the standard. The exterior walls of the prototype feature ECO-Block insulating concrete forms along with double-glazed, argon-filled aluminum-frame windows from Open Building Solutions, a New Zealand company. The windows – which were pressure tested at 50 Pascals before they were installed – feature a thermal barrier, sandwiched between the outer and inner sections of the frame, that is designed to prevent both heat transfer and condensation. Much of the window coverage is, of course, on the north side of the house, where passive solar gain from the Southern Hemisphere sun can be maximized. 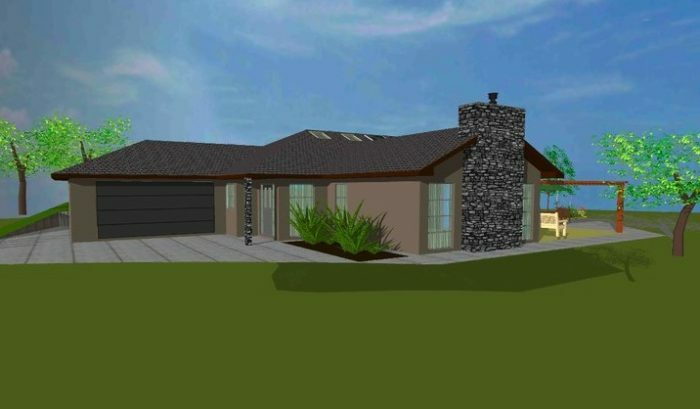 The house will be equipped with a heat-recovery ventilator, a solar hot water system, and accommodations for a photovoltaic system. Weather conditions in this part of New Zealand tend to be relatively mild, with a mean temperature, on the Fahrenheit scale, of 54, a high of 90, and a low of 27. Annual rainfall averages about 34 inches. The eHaus prototype will include a water recycling system designed to meet all of the occupants’ water needs except drinking and cooking. Iliffe told the Wanganui Chronicle, a local newspaper, that he and his partners understand eHaus will be catering to what is, at the moment, a niche market, but that stringent energy efficiency standards such as Passivhaus suit their personal philosophy about energy conservation. The energy goals are laudable. Shame about the layout. 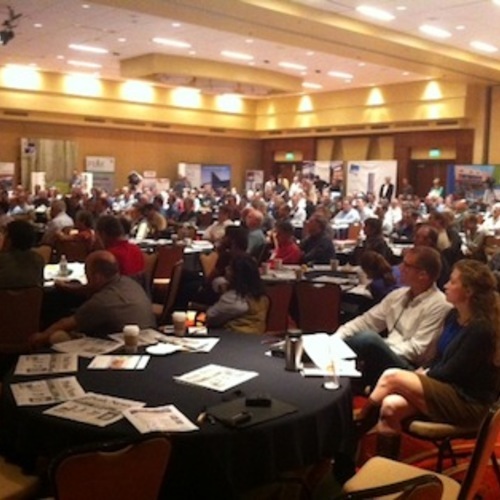 A house is not just a device for enclosing space, however energy-efficiently. I can't quite figure out why anyone remotely interested in the Passivhaus standard would build such a chimney, which screams, "Look at me -- I'm a thermal bridge!" You are right Martin about the mixed message the chimney gives, but I can assure you there is no thermal bridging going on as it is primarily aesthetic. Wanganui is a provincial town of 40,000 where about 75% of the homes use wood burners so it is in keeping with the houses around it. Its only the start, so please be patient! Hi Mr Iliffe, great to see you respond in person. What is the neighborhood like in lot size and other houses? Is this house much higher in cost from other similar looking houses? Hi Danny, the section sizes in the area are around 750m2. 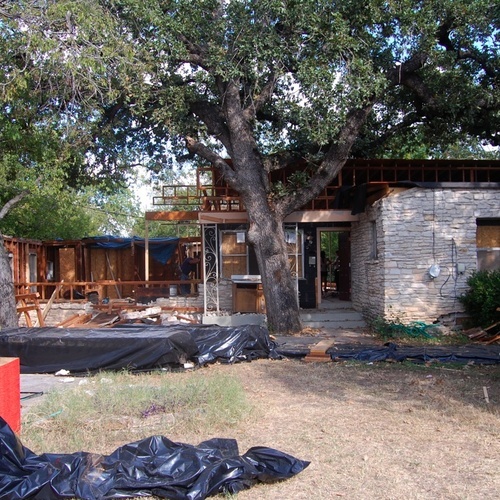 Our target is no more than 10% more for this house compared to a standard house.